Join AMA Nashville for our next power luncheon on May 9th at 11:00am at City Winery! Are you ready to re-imagine the future of marketing? For 75 years, marketing operated on the simple idea that: Brand = Promise + Experience. While the advent of social media has shattered one-way interruptions of promise-making in favor of co-created storytelling, this focused concentration on storytelling is harming our brands. The rapidly changing, post-digital, network–based world requires a NEW SET of PARADIGMS FOR the 21st Century Marketer. According to award-winning CMO and current CEO of the American Marketing Association Russ Klein , “Experience design is the next frontier for all enterprises and brands.” Without intentional experience design, a brand is at high risk of losing both its clarity and meaning, two essential predicates for brand building. Russ Klein’s new and patented construct, Brand = Experience STORY means a brand can be built on experience design alone and can be strengthened by effective storytelling. Without intentional and positive experience design, a brand cannot compete on storytelling alone. • How to become “insight-prone” and how storytelling figures into brand-building and experience design. Do not miss out on this opportunity to receive in person training with Russ Klein, one of the most distinguished, awarded and recognized marketers in our time. Russ Klein is an award winning five-time CMO who has quarterbacked teams for many of the world’s foremost brand names—holding top marketing and advertising posts at Dr Pepper/7UP Companies, Gatorade, 7-Eleven Corporation, Arby’s Restaurant Group and Burger King where he also served as president from 2003-2010. His Burger King body of work that was recognized by ADWEEK as “The Advertiser of the Decade” for the 2000’s…a distinction belonging to Nike and Budweiser in previous decades. Klein is a graduate of The Ohio State University and is a devoted and distinguished alumnus of Fisher College of Business; and also a graduate of the Harvard School of Business Advanced Management Program. • Klein was once nicknamed “Flamethrower” by an industry publication for risk-taking and provocative advertising; but he now aspires to be the torch bearer for all marketers. Or use Discounted Lyft Rides: We've partnered with Lyft to offer exclusive ride discounts to AMA Nashville! Save 10% off 2 rides to or from AMA Nashville with code AMA0509. AMA Nashville Marketing Professionals April Networking Mixer - After Tax: Relax! Enjoy the day after Tax Day with some economically beverages from one of the coolest hot dog joints around! Join us for fun, libations and a helluva good time at this cool eatery. Free parking and appetizers. If you’re part of the ever-growing – and ever-evolving – healthcare marketing community, then you know just how important it is to stay ahead of the curve. Join Nashville AMA’s Healthcare SIG at our networking mixer at Diskin Cider, Nashville's first craft cidery. Connect with fellow healthcare industry peers to share insight and discuss the latest trends. The 2019 Spring Internship Fair will be hosted and sponsored by GS&F on April 9, 2019 from 2-4 pm. During the event attendees will be able to tour the GS&F office, network with staff, interview with members of the leadership team. Current college sophomores, juniors, or seniors are invited. Internship opportunities are only open to college sophomores, juniors, and seniors. All internships will be for semesters/quarters in 2019. Maximum event capacity is 30 students. Join AMA Nashville for our next power luncheon on April 4th at 11:00am at City Winery! It’s not every day that a company buys the naming rights to a major sports venue. It’s an opportunity that comes along maybe once a decade. In this presentation, Carol Yochem, President-Middle Tennessee Region for First Tennessee Bank, will share why the bank decided to buy the naming rights to First Tennessee Park, what that decision has meant to the bank in terms of brand awareness and community relations, how this opportunity was a highly aligned fit for First Tennessee and how the bank made the most of the naming decision through coordinated marketing, community relations and employee engagement. The largest bank based in Tennessee, First Tennessee Bank is #1 in market share in every major market in the state except Nashville. Carol Yochem was named President – Middle Tennessee of First Tennessee Bank four years ago with a mandate to double the size of the bank in this market within five years. Increasing brand awareness was a part of the success equation. She and her team did it in four years. Nashville has become the model for how First Tennessee grows market share in cities where it is not already the leader. A lot went into achieving this success, but when it came to raising awareness of the First Tennessee brand in Nashville and Middle Tennessee, nothing came close to the decision to purchase the naming rights to the new home of the Nashville Sounds – First Tennessee Park – a decision that was made shortly after Carol was named president of this market. • The rationale behind purchasing the naming rights to First Tennessee Park. • The many ways in which this decision has closely connected First Tennessee to the Nashville and Middle Tennessee community. • How First Tennessee Park has bolstered the bank’s overall brand in this market. • Why this opportunity was practically tailormade for First Tennessee – and why taking advantage of it might not have made sense for other companies. • How First Tennessee activated its naming rights through using First Tennessee Park’s assets, the media, employee engagement, community relations, customer communications and charitable partnerships. • What’s on tap, marketing-wise, for the fifth season of First Tennessee Park that opens April 4th. Don’t miss this rare opportunity to get an inside look at an immensely powerful marketing tool that most marketing professionals can only dream about: putting your organization’s brand on a major sports venue. Carol Yochem is President of First Tennessee Bank in Middle Tennessee and has more than 30 years of banking experience. She oversees a combined loan & deposit portfolio of more than $9 billion and is proud to lead a team of nearly 600 employees who, through their hard work and commitment, have doubled the size of the bank in this region in the last 4 years. First Tennessee’s success in Middle Tennessee under Carol’s leadership is an example of the “growth” theme that has defined her career. Prior to coming to Nashville to accept her current position with First Tennessee, she was executive vice president and head of the wealth management business line for First-Citizens Bank & Trust in Raleigh, NC. Prior to that Carol spent 18 years at SunTrust Bank leading commercial, corporate, and private client divisions in both Memphis and Nashville. She was integral to the start and growth of SunTrust’s first Memphis office growing it from scratch to over $600M. She began her career with the same bank she helps lead today, joining First Tennessee’s management training program at its headquarters in Memphis soon after graduating from the University of Illinois at Urbana-Champaign. The excellent training program, which rotated her through many departments in the bank, was the foundation for a career working with teams who build better banks. Carol serves on a number of boards or committees where she is significantly engaged and making contributions benefiting the Middle Tennessee community. She is board chair of the Nashville Downtown Partnership, a member of the Nashville Chamber of Commerce board of directors and a leadership cabinet member of Partnership 2020, a member of YMCA of Middle Tennessee board of directors, an Andrew Jackson Foundation Board Trustee, alumnae of Leadership Nashville, and past Cheekwood Board Trustee. Or use Discounted Lyft Rides: We've partnered with Lyft to offer exclusive ride discounts to AMA Nashville! Save 10% off 2 rides to or from AMA Nashville with code AMA0404. Marketing is changing more quickly than ever. New trends, technology, tools and techniques abound. Let's meet and discuss these trends and more at our networking mixer! Join us and connect with marketing professionals from a wide array of industries and disciplines. Enjoy great camaraderie, stimulating discussion, and inspiring people. Join us for our March Networking Mixer at Marshall & Bruce. There will be wine, beer from Smith and Lentz, and Five Points Pizza for your indulgence! Discounted Lyft Rides: We've partnered with Lyft to offer exclusive ride discounts to AMA Nashville! Save 10% off 2 rides to or from AMA Nashville with code AMA0312. Next-Gen Marketing: New Tech. New Tools. New Thinking. Join AMA Nashville for our next power luncheon on Feb 21st at 11:00am at City Winery for a special guest speaker! This one you won't want to miss! Marketing is undergoing a spectacular renaissance ignited by remarkable levels of innovation that are reshaping the marketing landscape. In this special session, keynoter, futurist, and professor, Christina “CK” Kerley brings the audience on a tour of these transformative technologies—and features new ways to think about (and embrace!) these exciting changes. While mobile is powering billions of smartphones, the Internet of Things (IoT) will enliven trillions of smart things—and enables marketers to convert objects, products, and places into intelligent touchpoints all along the customer journey. Where Augmented Reality (AR) offers a new layer of new media atop the real world, and Virtual Reality(VR) provides the first truly immersive digital world—through Mixed Reality (MR), the physical and digital worlds collide . . . via holograms! By leveraging Big Data and Artificial Intelligence (AI), companies now have the power to anticipate customer needs, hyper-personalize product offerings, and contextualize messaging campaigns. And while apps have given our audiences unprecedented levels of convenience, intelligent bots will give them back what they value the most—their time. • New Technologies: A tour of the technologies driving remarkable changes across the marketing landscape, with examples spanning Mobile, IoT, AI, AR, VR, MR, and Big Data. • New Thinking: New ways to strategically think about these new capabilities—to help remove the fear of change, and get you excited about this new universe of marketing possibilities! Or use Discounted Lyft Rides: We've partnered with Lyft to offer exclusive ride discounts to AMA Nashville! Save 10% off 2 rides to or from AMA Nashville with code AMA0221. Powerhouse keynoter, futurist, and professor Christina “CK” Kerley pushes Fortune 500 companies ahead of the curve through the 10+tech that will dominate the next 10 years. Praised for her boundless energy, humor, and inspiration, she has wowed crowds at Verizon, Johnson & Johnson, Microsoft, Amazon, TEDx, E*TRADE, The United Nations, Bissell, Best Buy, Prudential, Cisco, Prudential,and more. A top-rated faculty member at Rutgers Business School for Exec Ed, CK tackles the tough topics: from The Tech Megatrends, IoT, and Business in the AI Age, to Next-Gen Marketing,Robotics, and High-Tech Health. Additionally, she has guest lectured at Stanford, Cornell, Carnegie Mellon, Northwestern, St. Peter’s, and USF. Connecting with myriad generations—from Boomers to Zoomers—she works with professionals in IT, marketing, sales, HR, innovation, and leadership. Come enjoy Chocolate and Wine at AMA Nashville's February Networking Mixer! Join us at Serendipity Labs - in one of the coolest co-working spaces in Downtown Nashville at the bottom of the L&C Tower. We will we pair some great wines with cool desserts, and as usual, some great networking opportunities. Hosted by Serendipity Labs and sponsored in part by EastLeigh Desserts and Piccolo Marketing. Parking: Not provided. Garages/lots in the area should run around $15. Discounted Lyft Rides: We've partnered with Lyft to offer exclusive ride discounts to AMA Nashville! Save 10% off 2 rides to or from AMA Nashville with code AMA0212. What’s one of the best kept secrets to multiplying sales and client happiness? The answer is in orchestrating powerful strategies and tactics that get your marketing and sales teams picking up the same song book, singing the same song and actually harmonizing together. Find out how you can improve results this way on November 15th when Missy Acosta, Vice President Brand Strategy for Delta Dental of Tennessee shares critical success strategies for getting Marketing and Sales teams work together to deliver amazing results. See you on November 15th at City Winery. This is a loaded program, not to be missed. 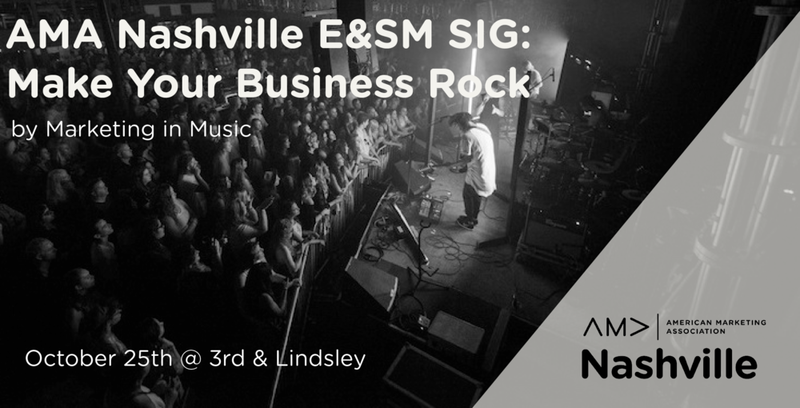 Join AMA Nashville's Entertainment & Sports Marketing SIG at 3rd & Lindsley on Thursday, October 25th 5:30 p.m. - 7:30 p.m., for a panel discussion with brands, bands, and businesses on marketing in the music industry. We’ll discuss how aligning your business with musicians, venues, and concerts can reach new audiences and enhance engagement with your existing customers. Our panel will include industry experts representing musicians, brands, and live events to provide insight on how brands and businesses benefit when marketing through the music industry. As an artist or venue, how do you find local sponsors for an event? How do you get local businesses involved? Haven’t seen a show at 3rd & Lindsley? Join the Entertainment & Sports SIG Sunday, October 28th at 8pm for Lightning 100 Nashville Sunday Night Show featuring Drivin N Cryin, an Atlanta-based folk rock act. Want to attend the panel event and the concert? This ticket is the way to go! You're excited about the panel and concert...but you want to bring a friend or spouse to the concert? This ticket is perfect! Only can attend our panel event? This ticket is for you! Only want to see the show? Grab your ticket here! *The first 30 concert tickets purchased through AMA will be designated "VIP" or reserved seating. All other tickets will be general seating. Food and drink are available for purchase during the show. **Panel event (all tickets) includes 1 drink ticket, additional food and drink are available for purchase during the event. Arrive by 5:00 to ensure you have time to park your car prior to the start of the panel at 5:30. Please click this link for parking information. Celebrate fall with AMA Nashville! Join AMA Nashville for the October Marketing Professionals Networking Mixer. Enjoy hosted appetizers by City Tap & a cash bar. 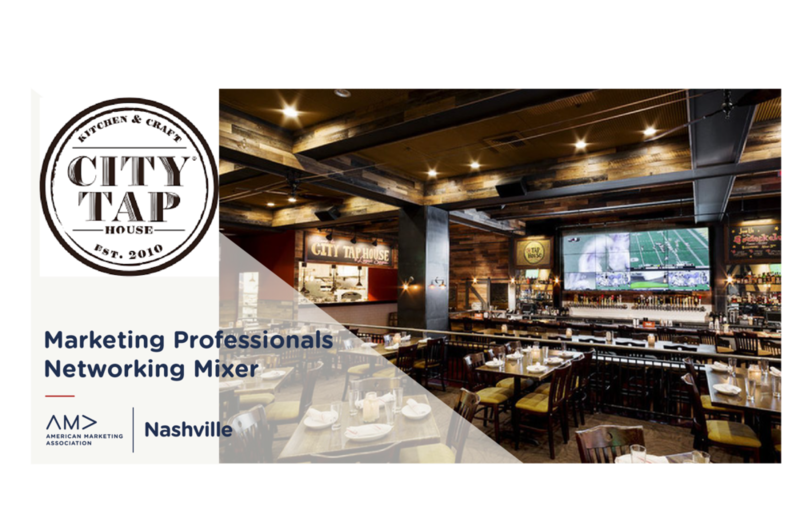 This networking mixer is free for AMA Nashville members and $10 for guests. Marketing the Marketer is a 1/2 day personal branding mini-conference that will teach attendees how to market themselves to future employers. Hear from speakers from some of the top companies in Nashville! Not only will you learn how to brand yourself but also how to network and what being a marketer means and the different industries that marketers can work in. Then we will wrap up the day with a panel of HR representatives that can answer your questions about what's acceptable when applying for a job. Ever wonder if it's ok to use Linkedin to reach out to HR or the hiring manager when applying for a job? Well, they will answer that question! 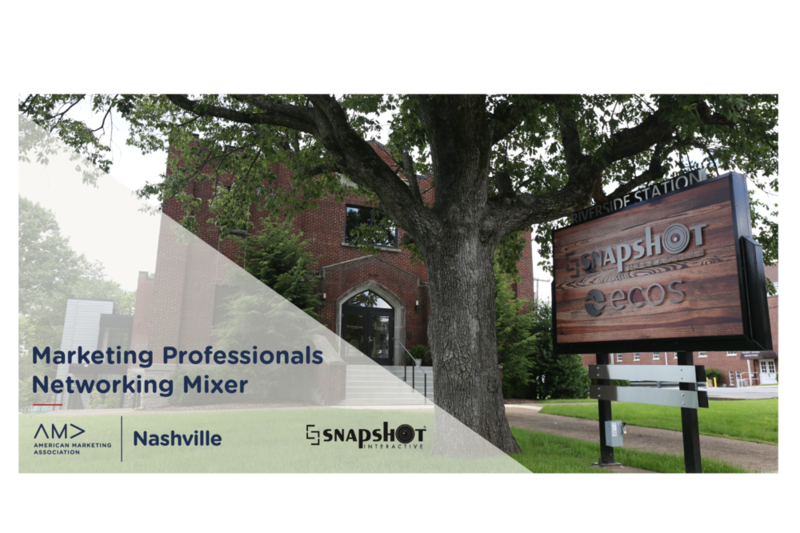 Join AMA Nashville for the September Marketing Professionals Networking Mixer. Beer, wine, and light appetizers provided. Join us at Riverside Station for networking and drinks in the heart of East Nashville. It may look like a church on the outside, but on the inside, the space has been converted into a modern workspace.